Most competitive disciplines have numerous pages of rules, restrictions and regulations. These are established in Competitive Dressage to ensure the humane treatment of the horse as well as to set a standard of excellence for the sport. 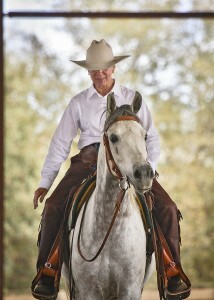 There is a new competitive discipline that is governed by many less pages – Cowboy Dressage. What do I mean? Allow me to use a genre that man has chosen to express himself since sun and moon and horses were caved on walls – Art. The value of Art is in the visual expression of the finished product. There is the movement seen in a stationary sculpture, a light in the darkness radiating from the canvas, the expression of joy or sadness, or who knows what by the Mona Lisa. Emotion in the viewer is evoked by Remington’s sculpture of the Indian on his pony, hunched over from the wind and cold and exhaustion. The art I am referring to has a recognizable image. It is contained in a canvas or bronze or wood. The essence of beauty is visual, yet unique. The artist expresses himself to the best of his ability in the finished product. But, where is the connection of Art to Cowboy Dressage? 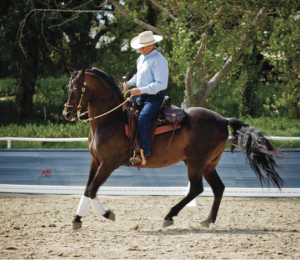 In Cowboy Dressage, the “canvas” is the court. The medium is the elements of the test. The visual expression is the performance of the test. The uniqueness is the breed of horse performing the movements. The artist is the rider AND the horse controlling the chisel or the brush. Voila! The finished work is revealed at the last salute. What is the judge (the ultimate viewer) looking for to score? Eitan’s vision of the expression of Cowboy Dressage is harmony and partnership between horse and rider, evident in the performance of the test. The lightness in the use of the aids by the rider, manifested in elegant self-carriage of the horse, from engaged haunches and elevated withers and poll. The visual presence of soft feel, imperceptible use of legs and seat and hands by the rider, and noticeable lack of extreme tension on the reins (and noticeable lack of extreme tension in the face and body of the horse and rider). Since all breeds of horses are generally performing the tests, the focus is on the quality of movement determined by the inherent gaits of that breed. The relaxed frame of the quarter horse will be more level than the relaxed frame of the Saddlebred. The stride of the Warmblood will be longer than that of the Morgan. Just as the final class, the Best in Show, in a dog show, the judging is based on the animal that magnifies the best qualities of their breed. So in Cowboy Dressage judging, the judge should be scoring according to the best movement a Quarter horse has to offer in his execution of the test, when the Quarter Horse is the one doing the test. If an Arabian enters at A, the judge should be looking for the best movement offered by the Arabian, a higher head carriage, light foot fall and perhaps more animated steps.All of this is to be in addition to the goal of flawless execution of the elements of the test, by a willing horse, responding respectfully to the direction of the rider. A square stop, a show of the free, working and collected frames of the horse, a round 10 meter or 20 meter circle, smooth transitions from walk to jog or jog to lope; turn on the haunches, turn on the forehand; absence of the horse’s head behind the vertical, absence of sluggish steps by the horse. As well, the four beat walk, the two beat jog and the three beat lope. It is as if the judge of Cowboy Dressage needs to develop a third eye. This third eye needs to see the harmony and partnership between horse and rider present in the performance of the test. Yes, it is a subjective element, not easily defined in words, but recognizable when it is happening.